I’m only a teensy bit obsessed with all things marshmallow. Did you know that about me by now?! I find more and more excuses to stir a little marshmallow cream into this and that and the other thing. I can’t help myself. I ♥ it! And it tastes sooooooo wonderful surrounded by chocolate…a moist cake and a creamy buttercream swirl. It’s a lovely fall ensemble! I created these cupcakes for more than my own selfish marshmallow needs, though. They are, first and foremost, a sweet treat to benefit sweet kids and their families who are dealing with cancer. I teamed up with OXO to Bake a Difference. 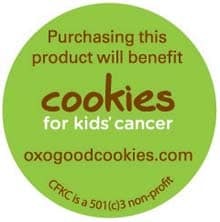 For this blog post, OXO will be donating $100 to Cookies for Kids’ Cancer, a non-profit organization founded in 2008 by two OXO employees who were inspired by their young son Liam’s battle with cancer. Be sure to keep an eye out for this sticker. 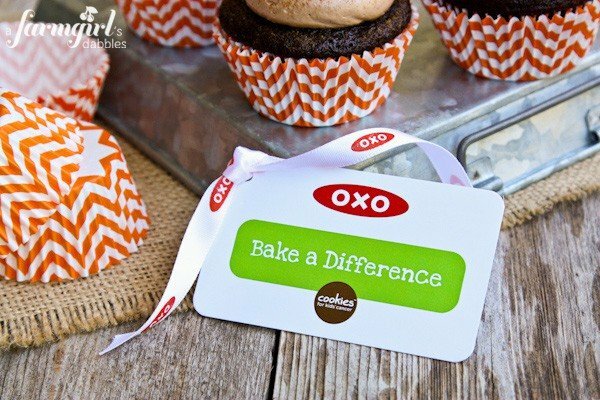 Purchase any of these stickered OXO Baking Tools and OXO will donate 25 cents in support of pediatric cancer as part of the company’s $100,000 pledge to Cookies for Kids’ Cancer in 2013. 100% of proceeds raised by Cookies for Kids’ Cancer fund pediatric cancer research. I had been wanting to try OXO’s cupcake corer, so this cause provided the perfect opportunity to do so. Previously, I was using a paring knife to cut little cone shapes out of the cupcake centers when I wanted to add a filling. Such a pain! This little tool turned out to be a super time saver, and proved itself worthy of being added to my gadget drawer. Preheat oven to 350°. Line 2 regular size cupcake pans with 24 paper liners and set aside. In a medium bowl, stir together all ingredients until incorporated. In a stand mixer fitted with a paddle, beat the butter until creamy. At low speed, beat in the powdered sugar. Increase the speed to high and beat until fluffy, scraping down the side of the bowl, about 2 minutes longer. At low speed, beat in the cream, vanilla, cinnamon, and salt, then gradually beat in the cooled chocolate. Scrape down the side of the bowl and the paddle, increase the speed to medium-high and beat until light, 3 minutes longer. Using a wooden spoon, vigorously beat the buttercream for 30 seconds to deflate any air bubbles. 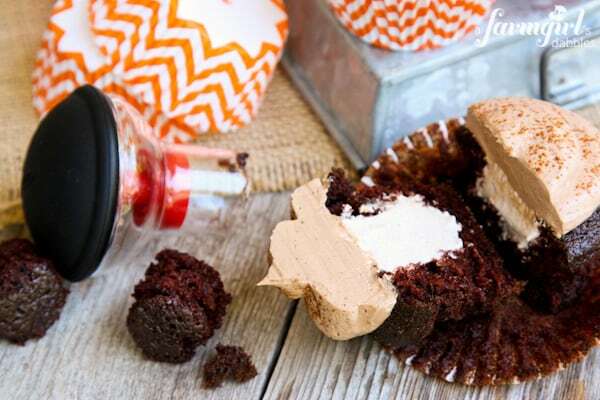 With a cupcake corer or a paring knife, cut a hole in the top center of each cupcake. Aim to cut about 1” deep. If the hole is any deeper, the cupcake gets weak. Spoon the pumpkin spice marshmallow filling into a pastry bag fitted with a large plain tip (or use a sturdy plastic zip bag and snip off a corner.). Pipe the marshmallow filling into each cupcake hole. Then spoon the chocolate buttercream into a pastry bag fitted with a large plain tip (I used Ateco No. 808) and swirl it on top of each cupcake. Finish with a dusting of cinnamon. 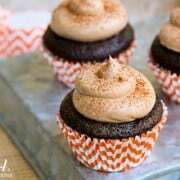 From a farmgirl’s dabbles, with chocolate cupcakes adapted from Mom’s Wacky Cake recipe. I was not compensated to write this post. OXO provided me with a set of cupcake baking tools and will be making a donation to Cookies for Kids’ Cancer for this post. So….why did you add the butter to the marshmallow fluff? Just curious why it couldn’t just be used on it’s own as the filling. Would it “melt”? Could I add melted chocolate to the marshmallow, and make it a chocolate marshmallow filling? And if I did that, would I still need butter? Absolutely gorgeous. I love that they are filled and frosted. I’m always game for a filled cupcake. Thank you, Amanda. And thanks for sharing, too! Gorgeous cupcakes! I would have a hard time not eating them all. Oh wow, you’ve combined all my favorites here! I love that frosting and such a great cause!!! Love OXO for all their community work! I’m a big fan of marshmallows, but I’ve somehow never made marshmallow fluff myself. Thanks for the reminder that I need to try it asap! Amazing! I’ll take 5 for dinner, please! These cupcakes look amazing! And God bless you for helping to benefit a cure for cancer. Love you dear daughter! Such pretty cupcakes, I love the flavors! These cupcakes sound incredible, Brenda! I love the chocolate-pumpkin flavor combo! I am so glad to see a big company do something for childhood cancer. Too many kids going through this awful stuff and not enough support like there is for breast cancer. Check out MiracleParty.org I think it is to see what a mother started and now has many volunteers. They really need support. Oh yum — these look amazing, Brenda! 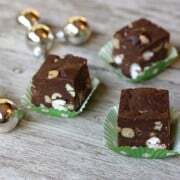 Can’t wait to make these Brenda! I have to go find that OXO cupcake corer tool! What a great way to help with a good cause and get another gadget to add to my baking drawer. The cupcakes sound like they will taste fantastic! Breanda these are so fun! 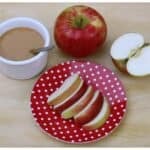 My kids would LOVE these as an after school treat. Just pinned to try soon!! 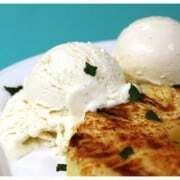 Is the pumpkin missing from the recipe or do the spices mimic the pumpkin flavor? Oh me oh my! This one might be a problem. I don’t think I can share these with my kids. Yum!!! So you are telling me I can bake cupcakes AND contribute the greater good? Lady, what a win! 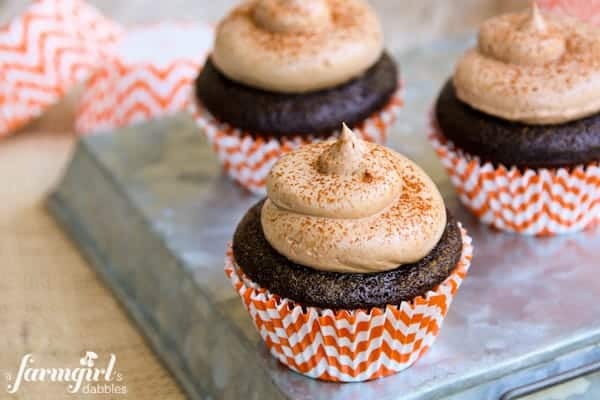 These cupcakes are totally my happy place: chocolate, pumpkin, and marshmallow. All of life’s good things! I’m definitely putting these on my ‘to make’ list. They look decadent and delicious. Love the cupcakes, love the frosting! Love everything! 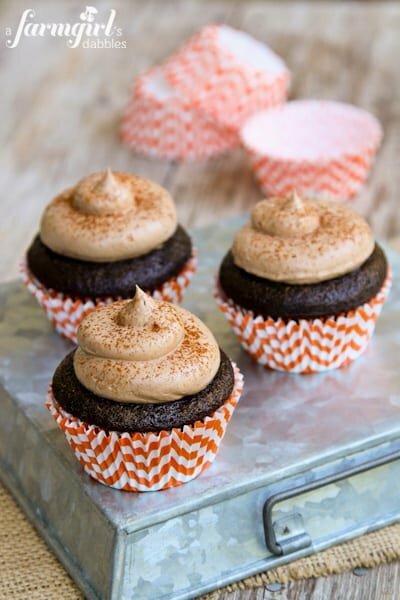 I love chocolate and pumpkin together! These cupcakes are fabulous! Wow…pumpkin spice + marshmallow….I’m sold! These cupcakes are beautiful! These are so cute, Brenda!! These are some of the greatest cupcakes I have seen in a while! Great cause and insane flavor!! I love the pumpkin spice marshmallow filling and that frosting? YUM! !